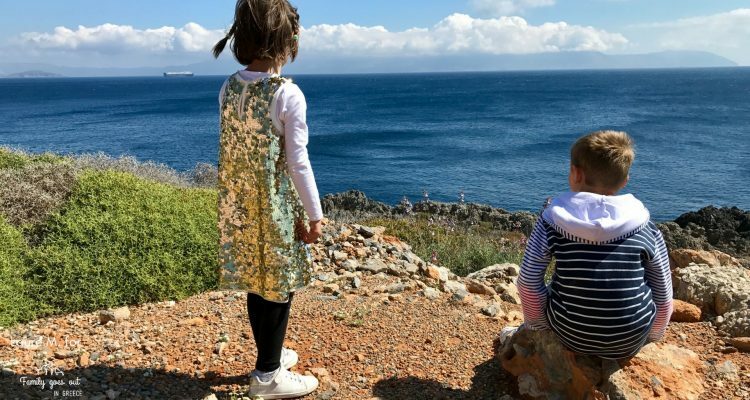 Kythira is the perfect island to spend a few days with family. It’s neither too big nor too small. You can go from one part to the other within 30-45 minutes by car. So the distances are not too long for the kids and parents won’t constantly “are we there yet?”. Kythira is not very touristic and the atmosphere is very calm. What can you do in Kythira? Many things. Dives in crystal clean waters, walks in the nature, natural waterfall, traditional taverns…there’s something for all tastes. Young and older ones will be very satisfied. We left for Kythira Friday night. It is easy to reach the island within 50 minutes by plane. The company Olympic air has many weekly flights. Also at the airport of Athens there is a reception especially for families to avoid waiting with suitcases. During the flight kids are given things to color and snacks. You can go to Kythira by ship in 1 hour and 15 minutes from Neapoli in Peloponnese. Kythira is known as the place where Aphrodite was born. It’s an opportunity to talk about mythology during our trip. «–Kids, do you know who Aphrodite is? – Of course not, she is the goddess of Beauty and Love». They do not yet make distinctions between the gods and the goddesses…we must keep on reading mythological books. It’s better to have a car on the island. If you don’t take your own car, the rentals can provide you child seats or booster seats for the older ones.